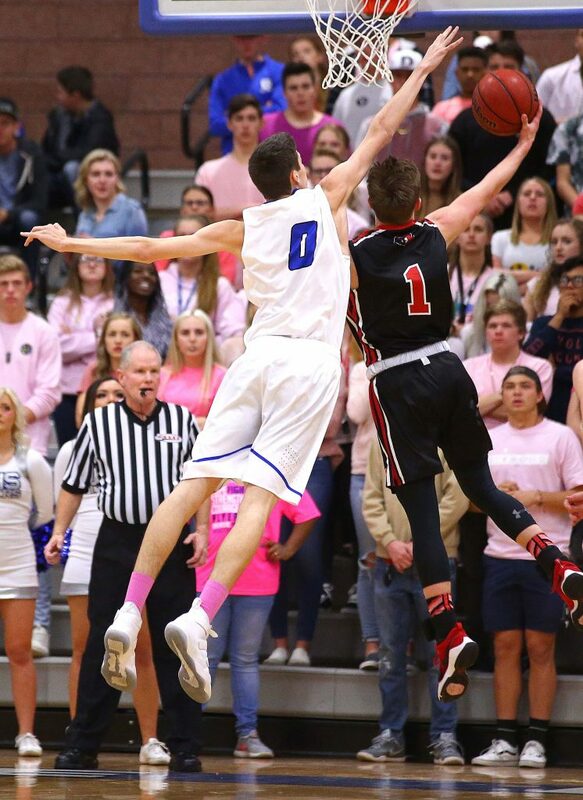 ST. GEORGE – The first round of the 4A state playoffs turned into quite an adventure for Region 9. Desert Hills survived a thriller Friday night, while Dixie and Hurricane used career-high games from star players to come away with victories. Only Canyon View, which had lost four straight, came up short this weekend. 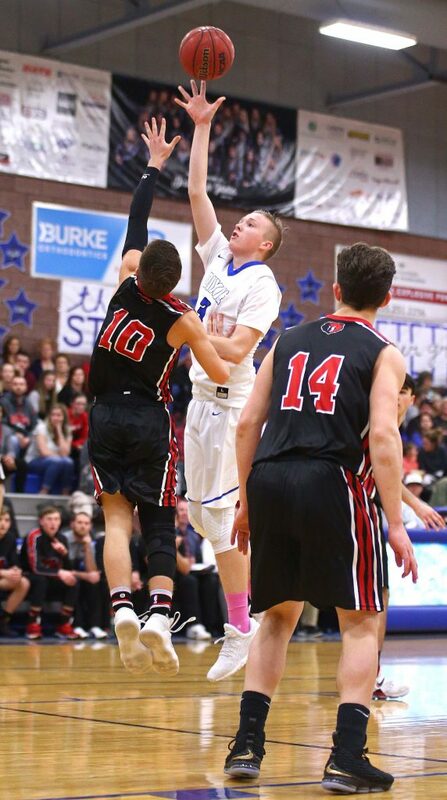 For the Flyers, it was a matter of great defense on Bear River’s best shooters and a huge game from Carson Bottema. For the Tigers, Reagan Marshall had the best game he’s ever had. 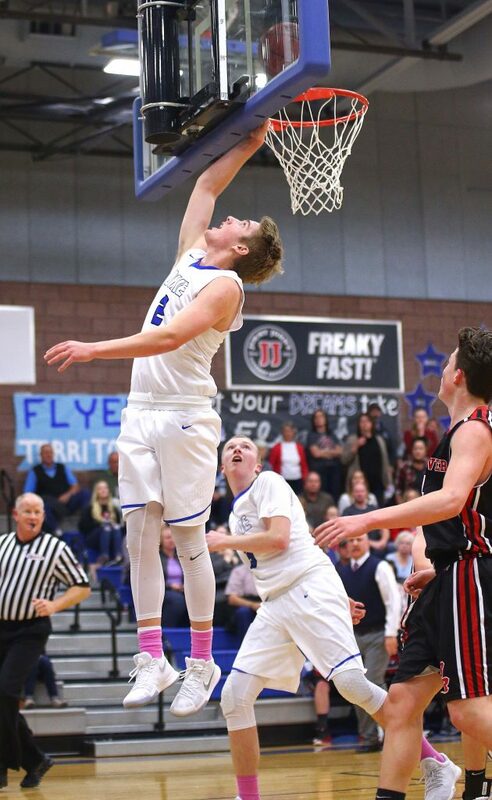 And for the Falcons, playing at top-seeded Sky View, size and athleticism by the Bobcats were just too much. 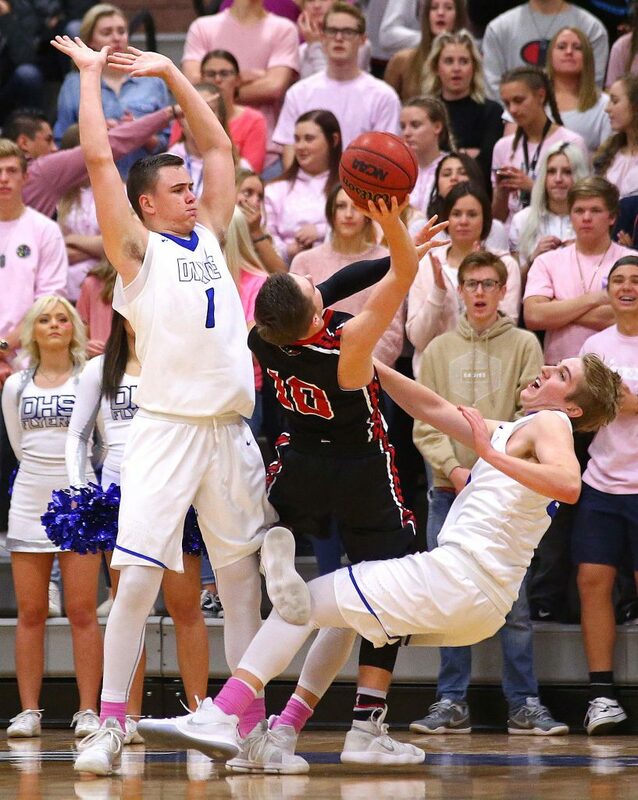 The Flyers had a unique task in trying to stop Bear River’s Ren Fonnesbeck and Mark Huber. The two sharp-shooters had combined for nearly 100 made 3-pointers on the season and were averaging a combined 26 points a game. The strategy worked to perfection as neither guard made a trey and the two were held to a combined seven points on seven free throws. Meanwhile, Bottema was scoring a career-high 27 points and Tanner Cuff added 15 as the Flyers grabbed the lead in the second quarter and never trailed after that. Even with the intense defense and Bottema’s heroics, fourth-seeded Bear River was thinking upset in the first half. Behind Jake Dahle and Parker Coombs, the Bears gutted out a 19-14 lead midway through the second quarter. 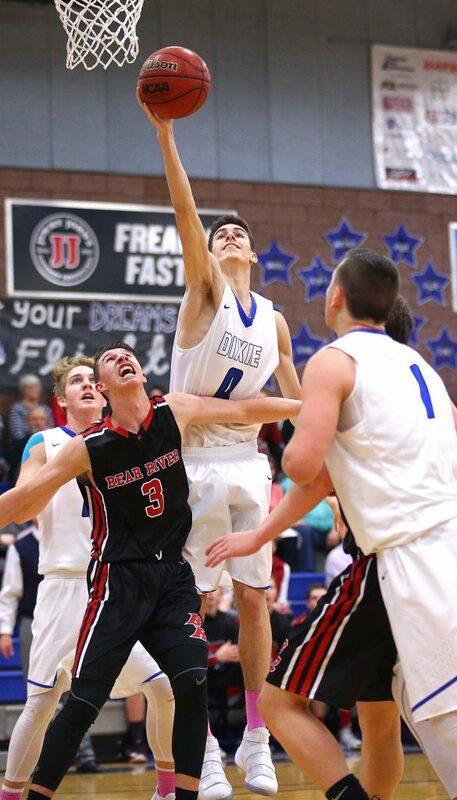 Dahle’s 3-pointer helped Bear River to that advantage, but Dixie had a run of its own coming. Bottema had a three-point play and then scored again to tie the game. 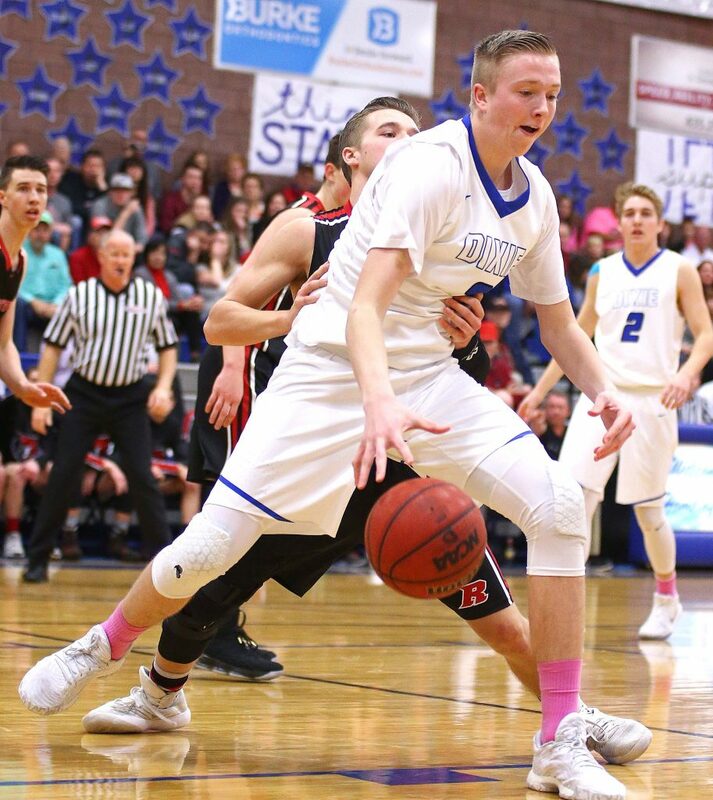 After a near steal by Dixie, Bear River’s bench was assessed a technical foul. 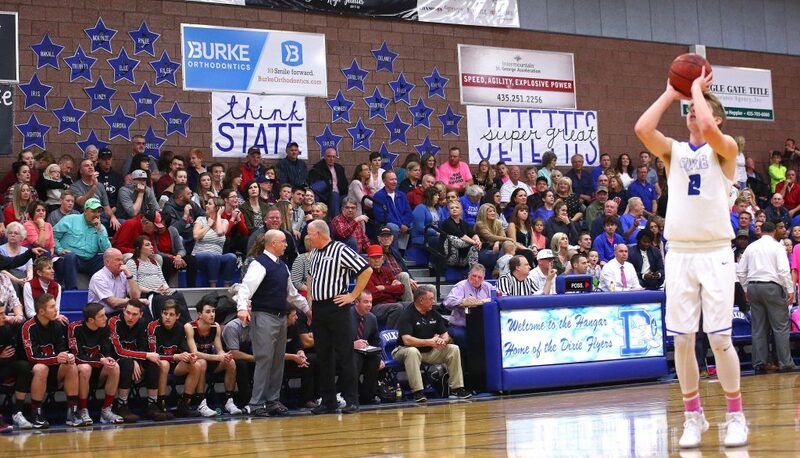 Bottema hit the two technical free throws and Dixie had surged for seven straight points and a 21-19 lead. 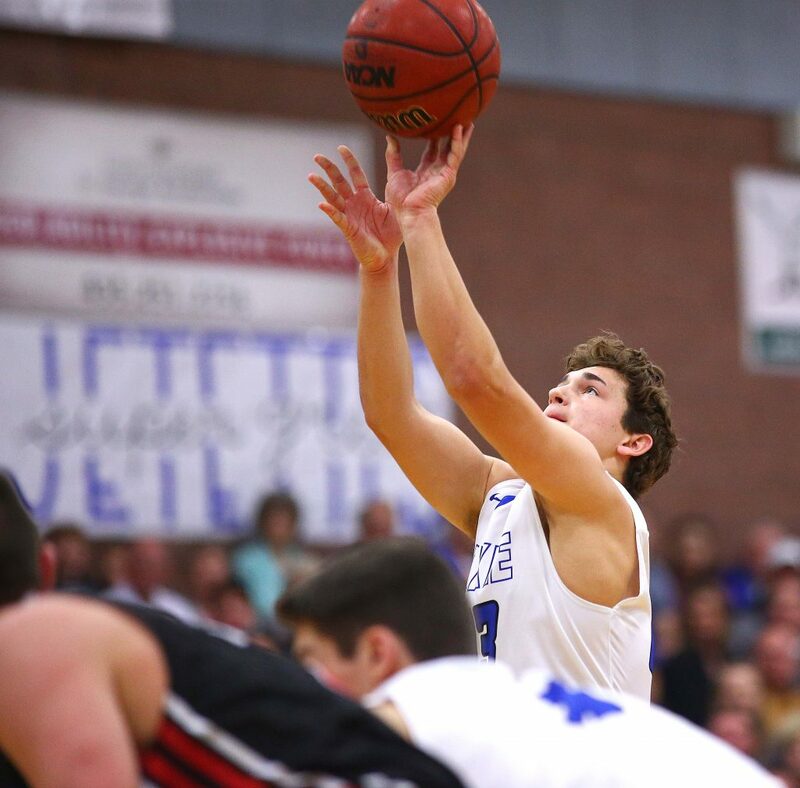 A couple of free throws by Jacob Barben and a bucket by Tanner Cuff just before halftime made it a 27-22 Dixie advantage at intermission. 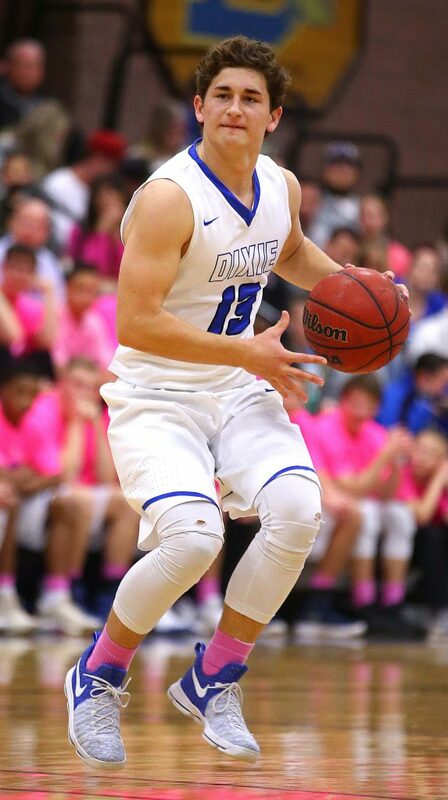 Bottema and Jace Bennett scored on backdoor passes early in the third as Dixie built the lead up to 11 points at 39-28. 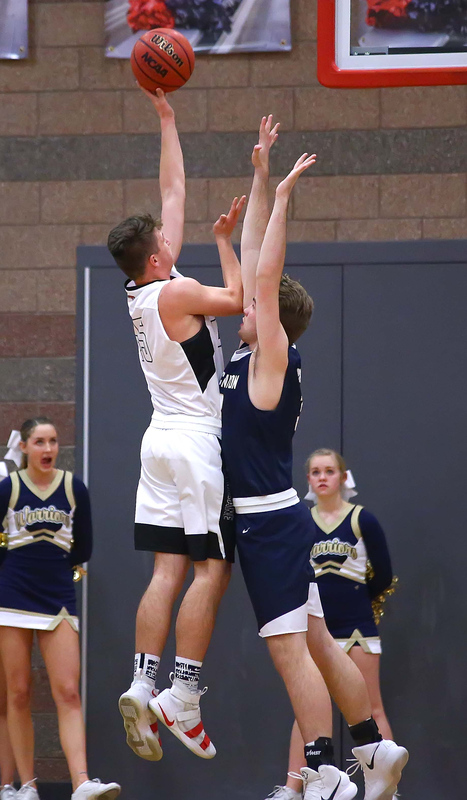 The Bears were able to creep within five in the fourth quarter behind the scoring of Coombs and Jacob Olsen, but Bottema hit a big corner trey to push the lead back to eight and the Flyers made their free throws down the stretch to clinch the win. Barben, a senior guard, came off the bench to make 10 of 11 free throws in the game, including eight straight in the final five minutes. 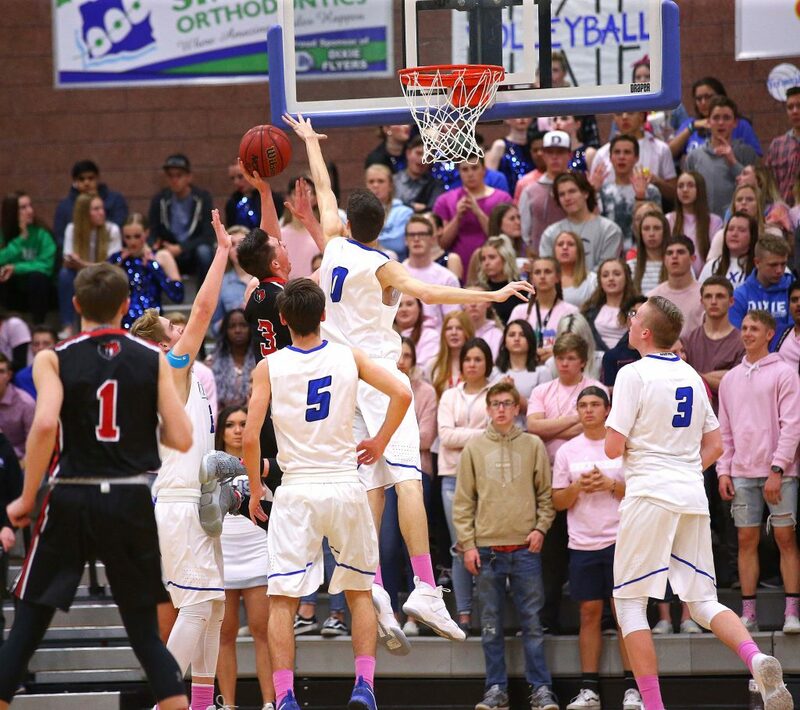 Dixie, 21-3, made 24 of 31 free throws in the game. 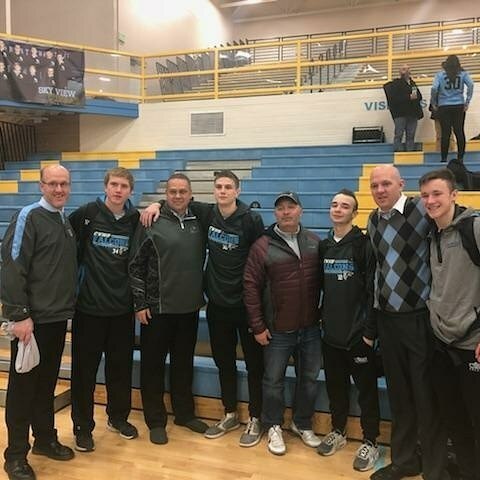 The Flyers advance to the state 4A quarterfinals and will play Salem Hills at 12:50 p.m. Thursday afternoon at the UCCU Center on the campus of Utah Valley University. The Flyers have won 10 straight games. 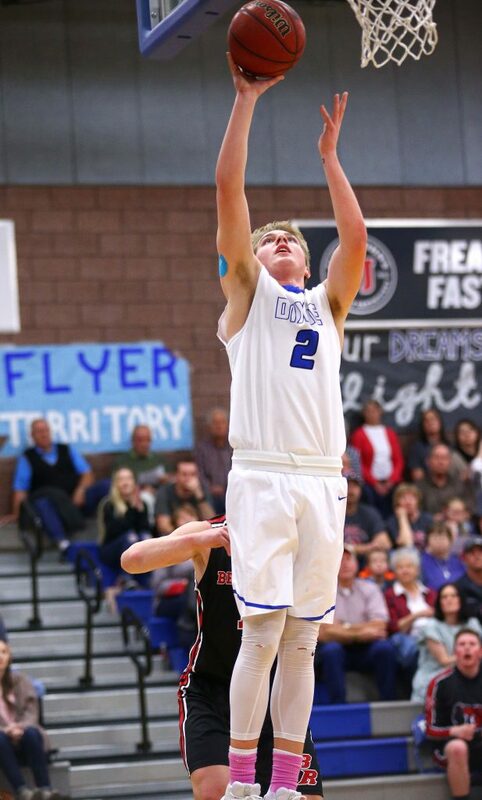 Dixie and Salem Hills met earlier this season with the Flyers taking a 72-65 win at the Ken Robinson Classic in St. George. Bear River, which ends the season with a 16-7 record, got 15 points from Olsen and 14 from Coombs. The Bears kept it close by making 16 of 19 free throws in the second half after making just 3 of 9 in the first two quarters. The Grizzlies decided to use the old basketball idea of taking out an opposing team’s star and making someone else beat them. It didn’t work. Double- and triple-teaming Hurricane’s Jackson Last was the game plan for Logan and the Grizz did a pretty good job of that, holding the talented star to just five points. However, winning that battle meant nothing in the war as the Tigers got 31 points from Reagan Marshall and 20 from the trio of CJ Minor, Adam Heyrend and Russell Neild to capture the road win Saturday night. Marshall, who has battled a torn hip muscle (that will require surgery) all year, received new treatment for some added arthritis he has in his hip and the meds helped him feel the best he has in months. Marshall missed just one shot all game and had seven rebounds and five assists in the game. In short, he was the player Langston and Tiger fans had envisioned going into the season. Marshall had 10 points in the first half as Hurricane took a 27-21 lead into the locker room. Logan scored four quick points on layups by Josh Jensen and Anthony McDade to start the third quarter and it was game on after that. Marshall’s trey in the closing seconds of the third quarter gave the Tigers a slim 41-38 lead heading into the final eight minutes. The Grizzlies took a brief lead with just over seven minutes left in the game as McDade scored in the paint to make it 42-41. Minor matched that paint bucket just a few seconds later to put the Tigers back on top. It was tied at 43-43 when Marshall scored inside, then hit a 3-pointer after a Logan turnover to make it 48-43. Grizzlies guard Charlie Jensen hit a big trey to cut it to 48-46, but Marshall struck again from deep to match it and make it 51-46 as the clock neared the three-minute mark. After Logan missed the front end of a one-and-one, Marshall hit a mid-range jumper to make it 53-46 with under two minutes to go and the Tigers started to feel the road win coming to fruition. The Grizzlies got no closer than five the rest of the way. Last ended up with five points, 12 rebounds, four assists and two blocked shots. Heyrend had six points and eight assists. The Tigers, 14-9, hit 25 of 46 shots (54 percent) and outrebounded Logan 30-23. McDade led Logan (13-10) with 21 points and Jared Bagley had 16. 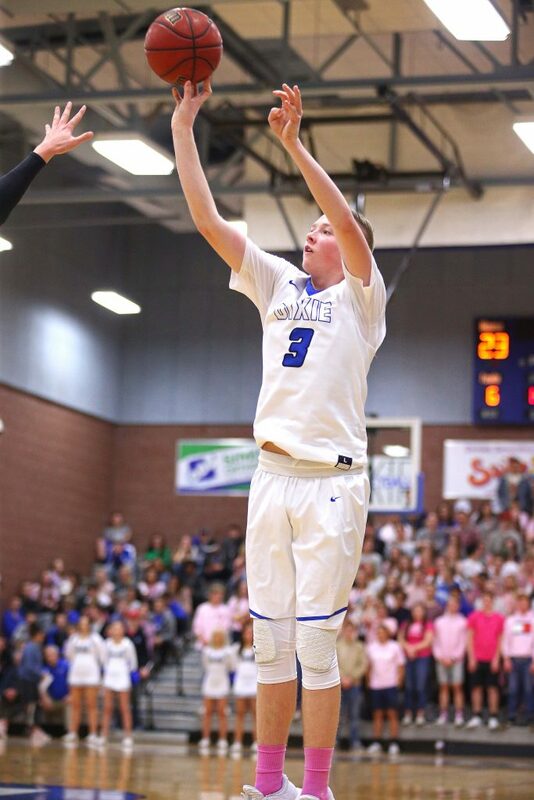 The victory advances Hurricane to the state quarterfinals Thursday, where the Tigers will play Juan Diego, the No. 1 seed from Region 11. 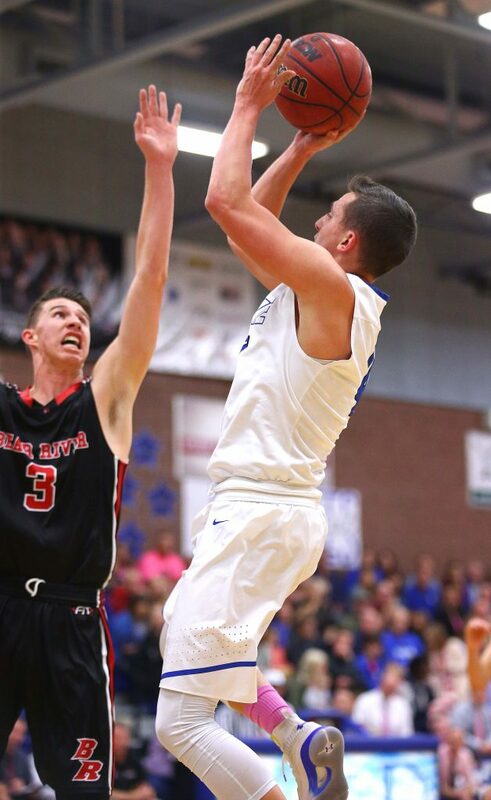 The Soaring Eagle beat Lehi 75-50 Saturday night. Game time at Utah Valley University’s UCCU Center is 9:30 a.m. The Falcons picked a bad time to slump, losing their fifth straight game Saturday against the No. 1-seeded Bobcats. Sophomore Mason Falslev made a big splash in the game, racking up 28 points, including three 3-pointers, and it was never really close. 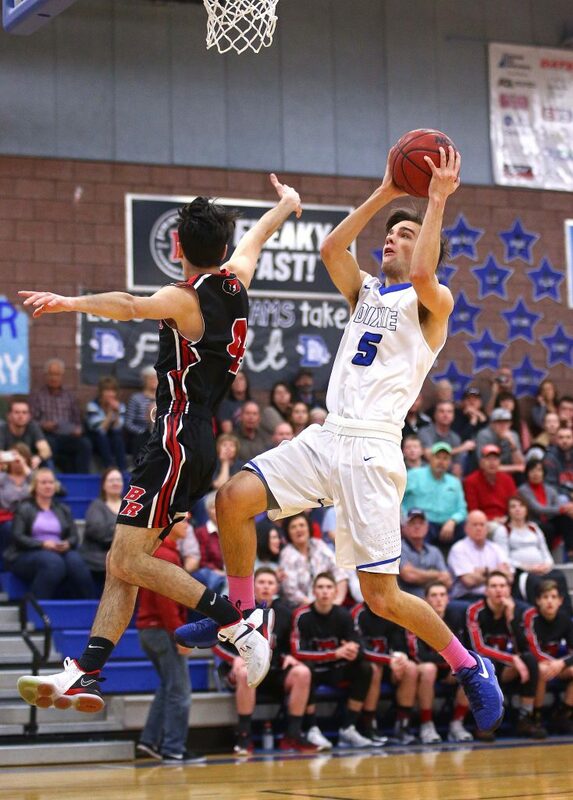 Sky View led 33-23 at the half and broke the game open by outscoring Canyon View 12-6 in the third quarter. Brantzen Blackner, who has had a brilliant career and is the all-time leading scorer at Canyon View, was held to nine points. The Bobcats allowed just one player, Parker Holmes, to reach double figures in scoring. He had 12 points. 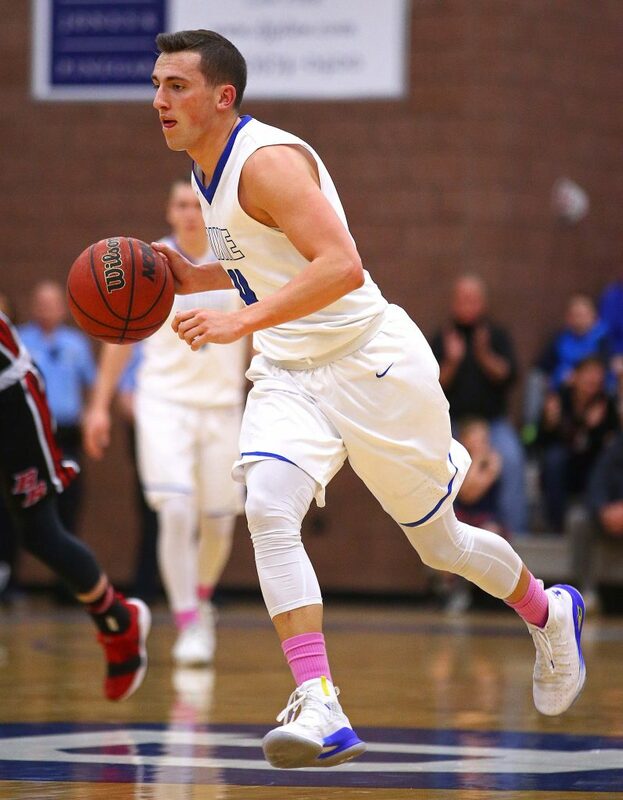 Falslev, a star receiver on the Sky View football team, was sharp, making 11 of 17 shots in the game, including 3 of the 5 treys he tried. Andrew Dean anchored the inside game for the taller Bobcats, scoring 16 points on 7 of 11 shooting. The dynamic senior trio of Blackner, Joey Lambeth and Toby Potter was held to 23 combined points, well below their combined average of 38 points a game. 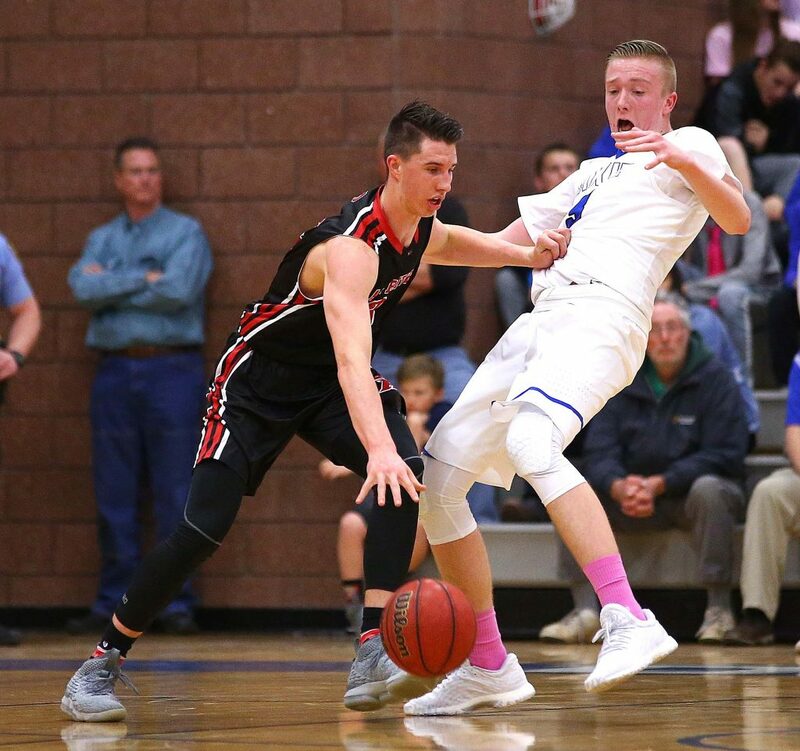 Canyon View, which had won five straight during one point in Region 9 action, closed on a downward slide, finishing the year with a 10-15 record. 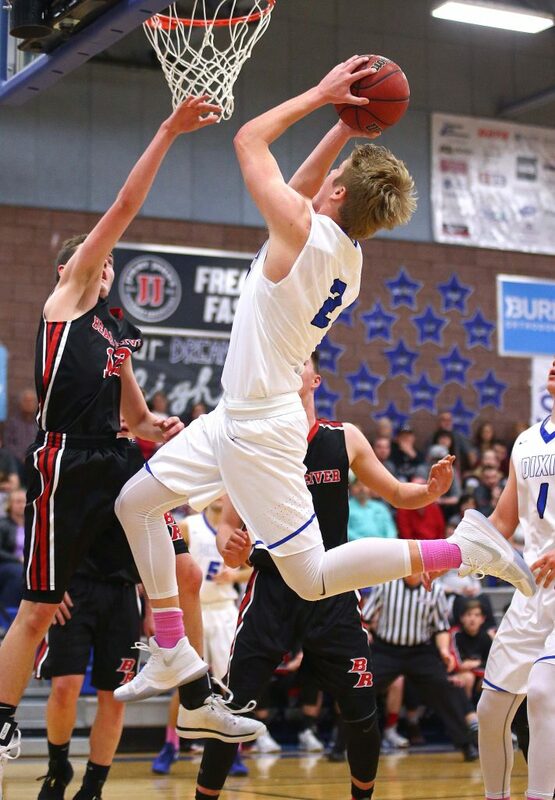 The Bobcats, 17-6, advance to the state quarterfinals and will play Payson at 2:30 p.m. Thursday at Utah Valley University’s UCCU Center. Region 10 No. 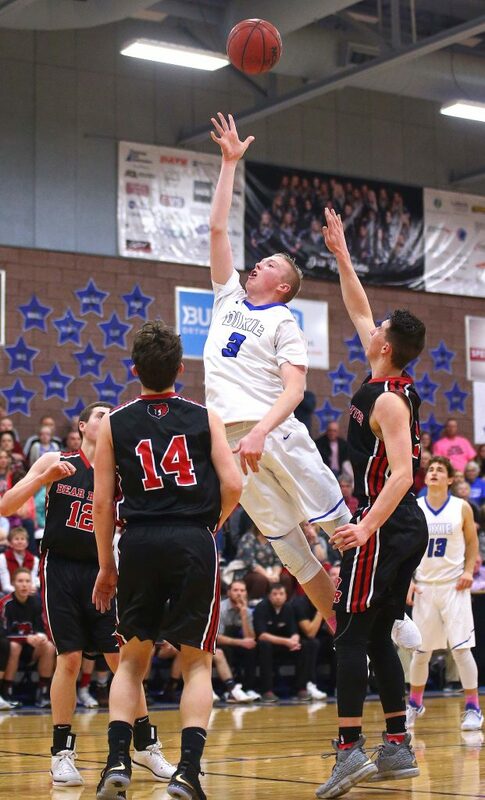 3 Payson (13-9) vs. Region 12 No. 1 Sky View (17-6), 2:30 p.m. Region 9 No. 1 Dixie (21-3) vs. Region 10 No. 2 Salem Hills (17-7), 12:50 p.m. Region 9 No. 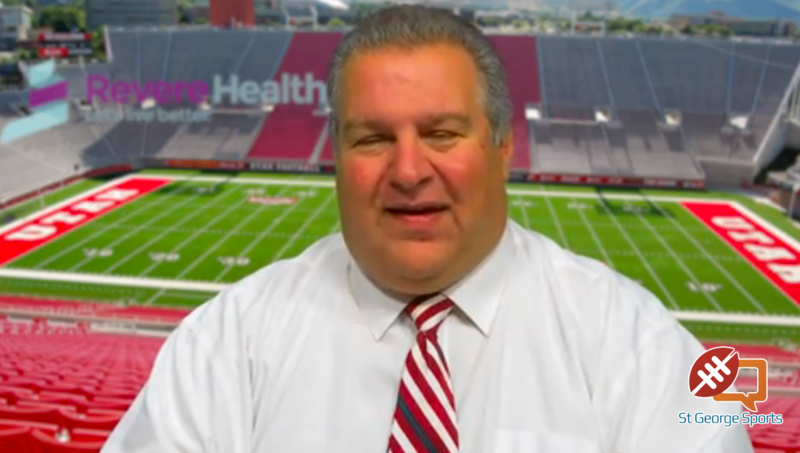 2 Desert Hills (17-6) vs. Region 10 No. 1 Orem (18-5), 11:10 a.m. Region 9 No. 3 Hurricane (14-9) vs. Region 11 No. 1 Juan Diego (20-4), 9:30 a.m.